The adopting grace of God is a major theme of the Christian faith, and today this theme has a new soundtrack. Bob Kauflin and Sovereign Grace Music today released their latest project, Sons & Daughters, a 12-song album accenting God’s gratuita adoptio. The album was intentionally written for congregational worship settings. … The project came out of a perceived lack of songs that help us meditate on the unfathomable love God has shown us in adopting us through Jesus Christ (Eph. 1:5). We are now part of God’s family—in Christ we will forever be the objects of God’s particular and passionate mercy and love. We are not only forgiven, we are co-heirs with Christ, and never again have to doubt God’s care for us. That biblical reality, rather than leaving us focused on ourselves, drives us once again to proclaim the greatness of the God whose grace turns hopeless rebels into precious children. The album can be sampled online and purchased as an audio CD ($12) or as a set of MP3 downloads ($9.00). Guitar charts, lead sheets and lyric sheets are available as free downloads. 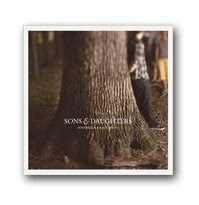 Sons & Daughters is the third album released by Sovereign Grace Music this summer. In June they released a children’s album, To Be Like Jesus. In July they released a live conference recording titled, Next 2009 Live.